This huge property has 18 miles of multiuse trails, which provide plenty of opportunity to enjoy birds and wildlife. To begin, check the open grassy area and oaks near the parking area for Red-headed Woodpeckers and Sherman’s Fox Squirrels, and then follow the loop trail through open pasture, watching for American Kestrel, Eastern Meadowlark, Loggerhead Shrike and Killdeer. The spur trail to Little Jones Creek is worth a peek during migration for wood-warblers like Ovenbird, Louisiana Waterthrush and Magnolia Warbler. House, Marsh and Sedge Wrens are present in winter, as are numerous sparrows (Field, Vesper, Savannah and Swamp). Other interesting species to keep an eye out for include Short-tailed Hawk, Roseate Spoonbill, American Bittern (winter), Wood Stork, Sora (winter), Purple Gallinule and Bachman’s Sparrow. 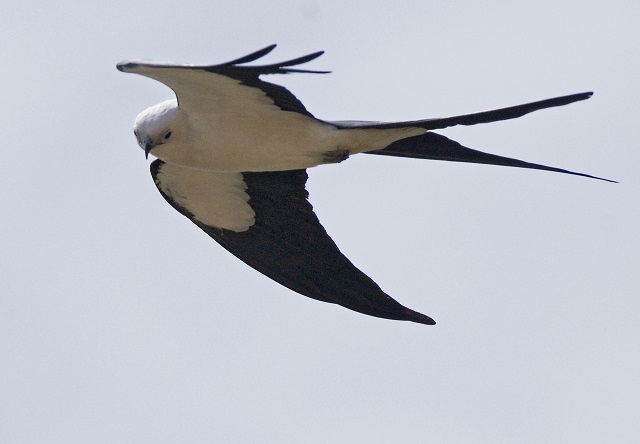 In July and August large groups of Swallow-tailed Kites gather in this area before they migrate south to Brazil for the winter. For lake access, a boat ramp and parking area are located near the south end of the WMA at Coleman Landing on CR 514/Warm Springs Rd. Scan the lake for Hooded Mergansers in winter and Pied-billed Grebes any time of year. The WMA is closed during special opportunity hunts; please click here for more information.